The “it” in question is a poisonous red-jellyfish, a luminous, undulating, mysterious creature around which the whole of Kiyoshi Kurosawa’s Bright Future (2003) revolves. It’s a truly remarkable subject, beautiful, graceful, amorphous – alive but distinctly remote and unreachable. Kurosawa’s films are always highly enigmatic, and the jellyfish in Bright Future is an embodiment of these qualities, the film’s reigning symbol. 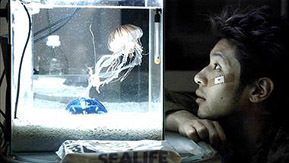 Too self-sufficient and formless to be assigned a single significance, the jellyfish nevertheless reflects (or absorbs) both of the central characters, Mamoru Arita (Todanabu Asano) and his friend and colleague Nimura (Joe Odagiri), as well as embodying the relationship between them. It’s reminiscent of the tree at the centre of Kurosawa’s 1999 film Charisma (perhaps his loopiest, and best) – both attest to Kurosawa’s fascination with creatures whose experience of existence has little in common with ours. Alive, but with no capacity for self-expression, their mode of perception is incommunicable. They are infinitely suggestive, blank screens collecting the characters’ (and the viewer’s) projections, while remaining stubbornly, tauntingly separate, possibly even unaware of anything outside of themselves. There is a profound beauty and an exhilarating sense of mystery to the jellyfish in Bright Future, but at the same time it embodies Kurosawa’s melancholy, even despairing vision of the yawning, unbridgeable chasm separating his characters from each other. Kurosawa’s conception of the relationship between human beings, of their yearning to connect and their inability to do so meaningfully, has something in common with that of Tsai Ming-liang. Both directors make films whose characters are painfully and hopelessly alone. Tsai finds a sort of deadpan, existential, Beckettian comedy in this vision of the human condition – his films are determinedly low-key, modest, and understated. Kurosawa’s, by contrast, exaggerate the theme, casting it in the hyperbolic terms of a dread-inducing and sometimes even apocalyptic horror. The definitive image in Kurosawa’s cinema may well be the spectacle, in Pulse (2001), of his characters watching in helpless terror as their friends or loved ones, or strangers to whom they’ve formed desperate attachments, literally disintegrate before their eyes into dust-like particles. At the end of Pulse, with the only two surviving characters striving desperately to hold on to each other while the world around them is destroyed, Kurosawa renders their tenuously shared solitude literal – they are seemingly the sole survivors of this apocalypse. Kurosawa’s characters are not simply lonely, however – his films (especially Cure , Barren Illusion  and Pulse) are populated by lost, aimless, alienated young men and women, usually hostile or at least indifferent to the adult world. This is a seemingly ubiquitous theme in world cinema recently, and in Asian cinema in particular – Jia Zhangke’s Platform (2000) and Unknown Pleasures (2002), Hou Hsiao-hsien’s Goodbye South Goodbye (1996) and Millennium Mambo (2001), Edward Yang’s A Brighter Summer Day (1991), and (from Central Asia) Serik Aprimov’s The Last Stop (1989) are some examples – but Kurosawa expresses it with a characteristically uncanny imaginative force, most memorably in Barren Illusion, the most abstract and puzzling of his films, when the lead character, alone and seemingly unaware, fades briefly out of and back into existence, without Kurosawa calling any special attention to it, much less offering any explicit explanation. It’s an inexplicable but disturbingly apt manifestation of his character’s state, suggesting an absence of any sense of self-definition or engagement with the world, a feeling of existential out-of-placeness. Yoshii in License to Live (1998) is an even more extreme example of this condition, having spent ten of his 26 years in a coma, and his dying words could be those of so many Kurosawa protagonists: “Did I exist?”. All of this is present in the image of the jellyfish in Bright Future, a creature which is certainly disengaged from the world around it, laying claim only tenuously to any shape or substance. Cloud-like, it suggests both the transparency of the protagonist of Barren Illusion and the transformation of those in Pulse who are reduced to swirling, luminous particles. What’s so interesting about the jellyfish in Bright Future, though, is its breathtaking beauty, which fascinates both Kurosawa and the characters themselves – if it initially reflects their alienation and existential anxiety, it gradually takes on a more paradoxical significance. Nimura is the central character in Bright Future, and he is immediately recognisable from Kurosawa’s other films, a lost, alienated, hollow young man (the quote which opens this piece draws the connection between Nimura and the passive jellyfish), who seems as if he’d be only too happy to fade away. The only thing preventing him is his relationship to Mamoru, a figure almost as mysterious and alien as the jellyfish itself. A friend and co-worker endowed with a deeply unnerving, even creepy self-confidence, Mamoru is in many ways the jellyfish’s human equivalent, sharing its otherworldly beauty, self-sufficiency, and impenetrability, as well as, ultimately, its deadliness. His relationship to Nimura is disturbing but paradoxical – he dominates him completely and effortlessly, but perhaps benevolently. In one of the film’s key scenes, he informs Nimura that he has worked out a pair of signs for his benefit, his thumb to his chest meaning “Wait”, his finger pointing outwards meaning “Go ahead.” “You’re always getting confused and then you don’t have a clue which way you’re going, so I’ll signal you”, he tells him, offending Nimura who feels that he is being mocked. But Mamoru is utterly sincere – his intention is to guide his otherwise helpless friend. What seems at first like a profoundly unhealthy, unbalanced friendship, reveals itself as something entirely different – Mamoru, for reasons which remain stubbornly obscure, has devoted his very existence to protecting and liberating the seemingly lost Nimura. Mamoru, in other words, is a kind of guardian angel to Nimura. 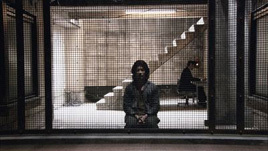 But since this is a Kiyoshi Kurosawa film, and therefore paradoxical to the core, he proves to be a deadly angel. Bright Future is unusual among Kurosawa’s films for its relatively hopeful, optimistic, at times almost heartwarming tone. But as an indication of how strange a filmmaker he is, the catalyst to the plot of his most sentimental film is the apparently unmotivated massacre of an innocent, harmless middle-aged man (Mamoru and Nimura’s boss) and his wife and daughter. The killings are carried out by Mamoru, who had earlier prevented Nimura from warning their boss of the jellyfish’s deadliness as he stuck his arm into the tank. But Nimura discovers the killings only when he goes to the house apparently intending to kill them himself, suggesting the theory (voiced later on in the film) that Mamoru has acted pre-emptively, in order to save Nimura from committing the murder. What follows Mamoru’s crime and eventual suicide on death row (for all this takes place within the film’s first half) is Nimura’s involvement with Mamoru’s estranged but sympathetic father, Arita (Tatsuya Fuji), the only adult in the film able to bridge the generational chasm. Devastated by the loss of his friend, Nimura seeks out Arita, befriends him, and forms an increasingly strong bond with this new father figure. As unique and uncategorisable as Kurosawa’s films are, they are generally rooted in genre – he has become something of a specialist in transforming certain categories of film (the serial killer thriller in Cure; the ghost story in Séance ; the horror film in Pulse), investing them with an unfamiliar sense of dread and social unease; although some of his best work has either exploded the concept of genre altogether (Barren Illusion) or seemingly created its own (Charisma). Bright Future lies somewhere in the middle of this spectrum – its relationship to genre seems loose at first, but as it takes shape it becomes increasingly recognisable and surprisingly affirmative, revealing itself as Kurosawa’s (characteristically strange) take on the melodrama of emotional reawakening and reconciliation. Kurosawa has always balanced unbounded dread with a qualified hopefulness, even in films as dark and cataclysmic as Charisma and Pulse. His films often pass through apocalypse to find some sort of small-scale hope among the survivors, even if there are no more than a handful. Indeed, apocalypse in Kurosawa’s films often functions as something of a necessary prologue to renewal, a beginning as much as an end. The unusual thing about Bright Future is that its particular apocalypse, the inexplicable murder of the boss and his family, occurs less than halfway through the film. Most of Bright Future is devoted to the possibility of healing and growth in the aftermath of this horror, a possibility Kurosawa has generally only alluded to in the past. Mamoru’s father and Nimura are a subtler, less sensationalistic version of the couple at the end of Pulse, two lonely, damaged souls clinging to each other for dear life. They are drawn together by their shared sadness at the loss of Mamoru, a loss Nimura compensates for by caring for the jellyfish. Having apparently killed it in a moment of rage at the end of the film’s first half, knocking over the fish tank and watching in horror as the creature slides across the floor and slips between a crack in the floorboards (an uncanny and overwhelmingly powerful image), he later finds that it has survived in the canals of Tokyo. Before Mamoru’s death, he and his friend strove to adapt the jellyfish to fresh water (a reflection of Mamoru’s efforts to help Nimura adapt to a meaningful existence), and Nimura now devotes himself to supplying the canals with brine shrimp, the jellyfish’s staple food. Arita disapproves of this effort at first, seeing it as a sign of denial and emotional paralysis, but upon seeing for himself that the jellyfish has not only survived but multiplied, the canals now saturated with the creatures, he joins in Nimura’s cause. But while their shared sense of loss at the death of Mamoru brings them together, providing them both with the possibility of connection and growth, the film suggests that their relationship is doomed precisely because it is founded on their dependence on Mamoru. Before he kills himself, Mamoru gives the jellyfish to Nimura, charging him with its well-being. But when Nimura spills his heart to his friend, telling him, “I’ve decided to wait after all – ten years or even 20 I’m going to wait for you”, Mamoru responds, “Then it’s all over, do whatever you want. Don’t come here anymore – if you do, I won’t even see you. We’re finished; I’m disappointed in you.” His reaction is shocking and inexplicable at first, as is his ghost’s efforts later on to sabotage Nimura’s feeding of the jellyfish. But it makes sense when one reflects on Mamoru’s desire for Nimura to take control of his life. Mamoru is disgusted because he realises that Nimura has become dependent on him. And having given the jellyfish to Nimura in order to provide him with something to focus his energies on, to give his life meaning, Mamoru turns against the creature when he perceives that Nimura’s devotion to it is a stagnant, unhealthy one, that it has meaning for him only insofar as he identifies it with his dead friend. Nimura succeeds in protecting the jellyfish and when it multiplies, filling the canals, it’s an apparent triumph, a reawakening for both Nimura and Arita. But at the end of the film, just when the deadliness of the jellyfish seems to have receded entirely, the father joyfully wades into the river, grabs one of them, and is stung. He doesn’t die – we see him back in his shop, alone except for another brief appearance by his son’s ghost – but Kurosawa implies that the relationship between Arita and Nimura is no more. Again, a seemingly mysterious conclusion – but the implication seems to be that the joy and healing provided by the jellyfish was illusory, founded as it was on a denial of death, a refusal to move on. Nimura and Arita succeed in connecting with each other, but their relationship is a flawed, stunted one – like the jellyfish, each has meaning for the other only as a manifestation of a ghost. This melancholy conclusion retrieves the film from the brink of sentimental affirmation with which it seemed to be flirting. If Bright Future still falls short of Kurosawa’s strongest work though, it is because it courts meaning too aggressively. It seems, at first, as puzzling and mysterious as any of his films, but the mystery is like a fog which gradually lifts. Kurosawa has always been plagued by a tendency to spell things out excessively, but in his best films either he has resisted this temptation, or his explanations have been defeated by the imaginative force and metaphorical slipperiness of his images and conceits. There’s often a tension in his films between the radically obscure and puzzling nature of the material he conjures up – the symbols, like the jellyfish in Bright Future and the tree in Charisma, which suggest numerous meanings while resisting them all – and his apparent anxiety to guide us through this jungle of possible significances and interpretations, to provide a coherent explanation for the literal-minded. When a character in Pulse compares the roving dots on her computer’s screen-saver, which are destroyed if they come too close together, to human relationships, Kurosawa is explicating his metaphors in a way which drains them of their power, and the same sort of thing is at work in Bright Future, especially when Nimura tells Mamoru’s father during their first meeting, “Actually it was really me they should’ve caught; Mamoru-san went ahead and did it so I couldn’t – that’s what I think.” It’s hard to believe Nimura would voice this so forthrightly, and it’s unnecessary for Kurosawa to do so. Bright Future is a moving and unconventional drama, but Kurosawa’s best films have been much more unique and challenging than that. The strangeness of the film doesn’t penetrate to its centre – it seems relatively skin-deep, a mystifying surface that masks the relatively conventional, familiar melodrama that eventually asserts itself. At one point Mamoru’s father exclaims to Nimura, “I saw the jellyfish, I really did – it was beautiful. But what’s going to come of it? Will it change reality? Will it help you get what you want?…Why don’t you try looking at what’s right in front of you?” This is a groan-inducing passage – the business with the jellyfish has been reduced to not much more than a coy substitute for the melodramatic, cliched substance of this scene, which veers dangerously close to the stuff of soap-operas. At this moment Kurosawa’s symbols no longer evoke loss or emotional stasis, they represent them, they stand in for them, in a redundant, reductive, one-to-one fashion. Nevertheless, there are always images, moments, and moods in Kurosawa’s films which take on a life of their own, even when the whole is less than the sum of its parts; and Bright Future is no exception. The jellyfish is an inspired symbol, no matter how much Kurosawa freights it with meaning. And his portrait of Mamoru and Nimura’s alienation from the adult world is a profoundly disturbing one – its creepiness never completely dissipates even as the film takes a more humanistic turn. However fathomable Mamoru’s motive for killing the boss and his family may be, we’re left with the uncomfortable mystery of why Nimura intended to carry out the murder himself. Whether or not we take this action literally, Kurosawa has tapped into a vein of social unease which refuses to be resolved. The movie ends not with Nimura (who simply disappears from the film after Mamoru’s father is stung), nor with Arita, but with a gang of young, rather ridiculous youths, bedecked with flashing walkie-talkie headsets and Che Guevara t-shirts. Their only other appearance in the film came much earlier, during a short-lived falling-out between Nimura and Arita, when Nimura meets them in a food-court and eventually helps them break into the office where his well-meaning but distant sister has secured him a “regular” job. Their destruction of the up-scale office might be taken as an act of rebellion against a stifling, deadening world, but it’s far from a self-conscious one, and they’re all caught (except for Nimura). The film ends with the gang sauntering aimlessly down the street, confident and self-assured, but with nothing to do but play-fight each other and kick cardboard boxes lying in their path. When the title Bright Future comes up over this image, it’s difficult not to take it sarcastically. But even if Kurosawa identifies with their refusal to be integrated into society, the alternative they’ve chosen isn’t a very inspiring one. And in any case, the emphasis at the end of Bright Future isn’t on this gang of kids, but on the absence of Nimura, who seems to have succumbed to a darker fate – like his double in Barren Illusion, he has faded out of existence, seemingly for good. Bright Future will screen at the Melbourne International Film Festival on 23 July and 31 July.